How to make original beads from the fabric with their own hands? 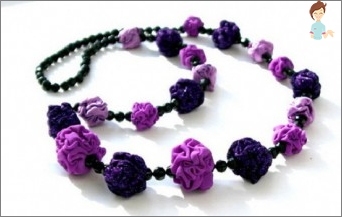 Who would have guessed that beads made of clothWill make a real sensation in the world of high fashion. It seems that it is simply impossible to build such beauty from ordinary cloth patches, especially with your own hands. 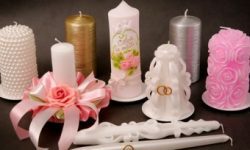 In fact, jewelry made of fabric is made very simply and quickly, and the whole creative process does not bring anything but pleasure and joy from the final result. What supplies can I need? 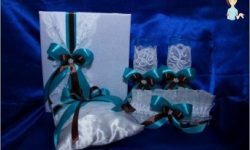 Beads from the fabric can be made with their own hands literally from any unnecessary flap, which takes up space in the working chest, box or wardrobe for years. In the process of work, literally any small thing or trifle can come in handy, beginning with a patterned braid, and finishing with metal chains or textile cuts of different colors and unusual texture. Just before you plan yourself Make beads. Think about what clothes they will wear. Depending on this, either the variegated flaps, or the monophonic and similarly shaded pieces of tissue are selected. 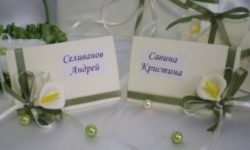 Do not forget about the possibility of additional decoration of the craft by means of beads, buttons, satin ribbons or rhinestones. 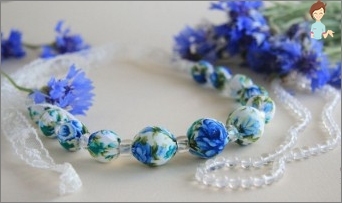 The most original beads - These are those that are made with the effect of a smooth color transition material. 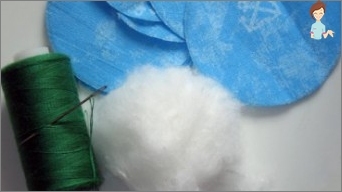 Even for convenient work, you will need scissors, sintepon, needles, threads of matching colors and cotton wool. It is believed that there are ten, if not more,Options for how to collect beads from fabric and ceramic or plastic beads. Among the possible schemes are available exclusively to experienced craftsmen, and there are those that are ready to be made even by novice needlewomen. In this case it is important to choose the most advantageousA combination of consumables, rather than acting at random. For example, a combination of velvet with a glass bead, transparent or even crystal beads looks great. Also a tandem from metal and textile beads looks like a win. After that it will just be hard to tie the ends of the beads. In principle, if all this seems to you too muchDifficult, try to make first beads, individually covered with fabric. 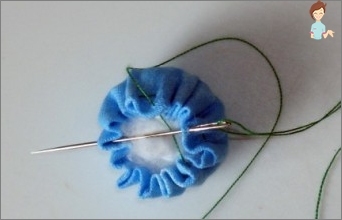 To do this you will need a glue pencil, rectangular textile flaps, beads themselves, a spoke and scissors. For the chic, you can alternate Covered Beads and ordinary, made of metal, plastic or wood. Another method requires a sewing machine,Or the ability to gently sew with your hands. Initially, we take a cloth flap of the necessary length and width so that it can be freely wrapped in a bead. The cut is sewn along its entire length, and with the help of a knitting needle it is turned out on the front side. In the formed tube we lay the first bead, above it Make a knot, Or we bind the base with a silk thread of the required color. Similarly, you need to enter the end of the fabric strip, achieving the desired length of the decoration. Developing the topic of textile ornaments, it would be unfair not to write a volume about how beads are made from fabric by the technique of blinking, which you can also really create with your own hands. Beads can be the same or different colors, and holes in them are made by an ordinary awl. Now you know that not one, not even the mostA minimal piece of ribbon, scraps of cloth or lace can not be ruthlessly thrown into the trash can. All this wealth can be an ideal material for the creation of exclusive author's jewelry, which will not be analogous all over the world.